Suppose you are an astronaut out in space. You have nothing with you except your wits and … a fire extinguisher? 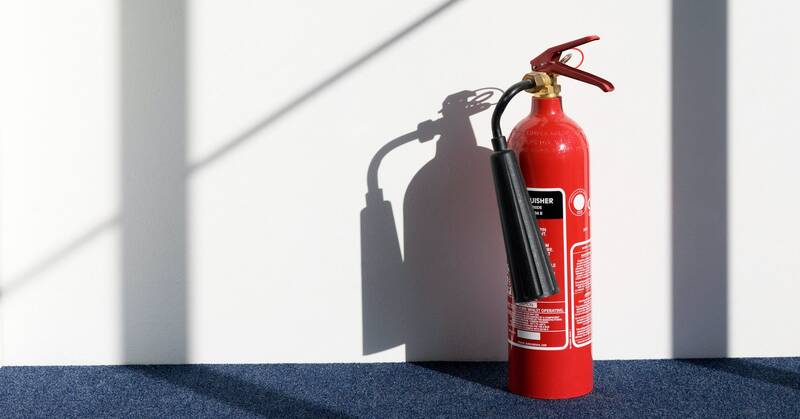 Why a fire extinguisher? Because that’s what Sandra Bullock’s character has in the movie Gravity. Because a fire extinguisher shoots out gas (normally to put out a fire), it can also be used to produce thrust and help you maneuver in space. But would this really work? That is what the MythBusters, for whom I’m a science consultant, set out to test in a recent episode. The MythBusters started by trying to create a similar situation on the surface of the Earth. They used a leaf blower to fashion a one-person hovercraft (it’s not too hard to build one yourself). They let it loose on an ice rink, which pretty much eliminated the frictional force. Then they used a fire extinguisher for thrust and tried maneuvering around on the ice. It turned out that the fire extinguisher wasn’t so great for controlling the motion of the hovercraft. No one could avoid the obstacles set up on the ice. The problems with the fire extinguisher thruster are twofold: First, it doesn’t push that hard on the hovercraft. So you would need to generate thrust for a significant amount of time to get a noticeable change in motion. Second, the way force changes the motion of an object doesn’t agree with our basic intuitions about force. It’s this second part that makes it difficult to fly a fire extinguisher in space. That force model seems to work just about all the time. One case where it doesn’t work is with the hovercraft on the ice. In this case, the hovercraft is given a push to get it moving. After that, the person stops pushing—but the hovercraft JUST KEEPS MOVING! I honestly think that’s why humans like ice. Things on ice don’t follow our normal force models. Since this model of “force equals motion” doesn’t work on ice, it clearly isn’t the best model. Here, I can describe a better force model with three gifs. Let’s take a low-friction (almost frictionless) cart and push with a constant force. Here is what happens. In case you can’t tell, the cart is increasing in speed. Honestly, it’s difficult for humans to detect changes in speed. Usually we just break motions into three categories: not moving, slow, fast. But trust me. This cart is increasing in speed. So if you push on an object with a force in the same direction that the object is moving, it will speed up. In this case, the backwards force makes the cart slow down. It slows down so much that it eventually stops. Once it stops, the cart starts moving back to the right and speeds up—since it’s now a forwards force. I couldn’t do this with the cart, so I used a yo-yo instead. Here is a top view of a yo-yo moving in a circle. The force on the yo-yo is from the string and it is always pulling in a direction perpendicular to the motion of the yo-yo. This means the yo-yo constantly changes direction even though it’s mostly moving at the same speed. What happens when I let go of the string? With no more sideways force, the yo-yo goes back to moving in a straight line at a constant speed (mostly constant). So, why do humans get this so wrong? We aren’t so bad at making models, but we do have trouble seeing friction as a force. Since friction is just about everywhere, we think that pushing with a constant force makes something move at a constant speed. In fact, there is zero net force in this case. The force of you pushing balances out the frictional force to make essentially no force. No force means no change in motion. But still, it’s caused by the always-present friction. OK, I get it. You weren’t able to be on set when the MythBusters tested their hovercraft with the fire extinguisher. Don’t worry, I wasn’t able to be there either. But I have the next best thing—a fire extinguisher simulator. Yes. I made this for you. Here’s how it works. When you click the Run button, the big disk starts moving to the right. There is a constant force from the fire extinguisher that pushes in the direction of the arrow. You can use the mouse to move that arrow in whatever direction you think is the best. Now, can you avoid that wall? Here is your chance. Remember, the arrow is the direction of the force. It’s not the direction you would point the fire extinguisher. Nothing in the code prevents you from just going through the wall. There is no wall, there is no spoon. It’s just there for decorations. No, you can’t turn the fire extinguisher off. It stays on for 20 seconds. You can see that it’s not impossible to avoid the wall, but it’s not trivial either. Just imagine if the hovercraft was also spinning. This would be crazy hard. You could change the rotational rate of the hovercraft with a fire extinguisher thrust that was not directed at the center of mass. This would then exert an external torque AND an external force. Coding that would be a bit more difficult, though, so I left that part out.